Okay, today I have something for you to try in the gym or at home. It is a dumbbell complex from Shawna Kaminski. Hey Shawna K. of Challenge Workouts. Today, I want to get a video to my good friend and fellow Canadian, Rick Kaselj, who we all know is a master at dealing with your muscle imbalances. 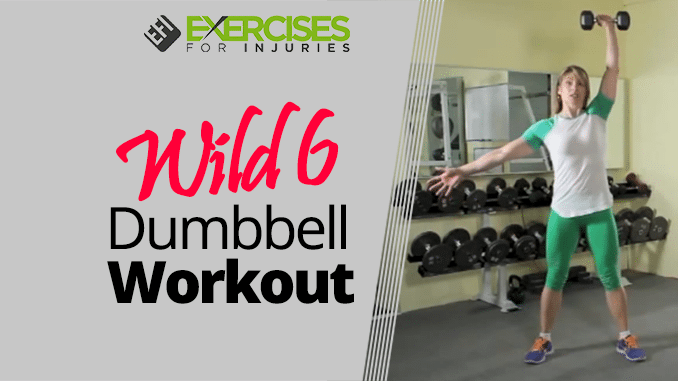 Now one way that I like to deal with my muscle imbalances, and those of my clients, is to do a dumbbell workout and more specifically Single Arm Dumbbell Work. 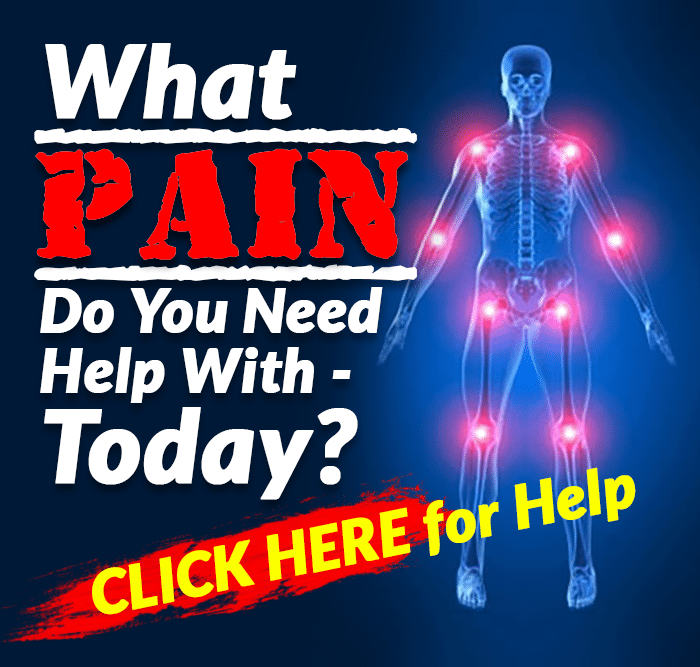 This not only reveals where muscle imbalances are but it helps you to address them. You are always going to have a gap between your weak and strong sides but you can lessen the gap. One way to do that is the Single Arm Workout and always be doing your weak side first when you are strong and fresh. Do the workout that follows and enjoy that challenge complex. Do 6 – 10 total sets, or 3 – 5 sets per side. Our challenge today is called “OK to Be Single.” You are going to start with one dumbbell on your weak and dumb side. Everybody has got a weaker side and if you don’t know which is your weaker side, decide which arm you may want to start with it’s not that side, it’s the other one. You are always starting on the weak side because that’s when you are freshest and you can concentrate more effort on that weak side. We are going to start off with an overhead squat. The dumbbell is going to be overhead. We’ve got 10 reps in every position. You can use that other hand for balance and try to count at the same time. Keep that chin nice and high. From here I am going to do a Thruster with the same arm for 10 repetitions. Then I am going to do a 1 Leg RDL (Romanian Deadlift) with just one dumbbell. It takes a little bit of balance here working that hamstring. Try to keep those ears in line with the shoulders, spot right in front of you. Do 10 reps of this. From here I am going to do a dumbbell row but I am going to change the leg and I am going to rest my hand on my leg. Now I am doing a row, nice flat back, and a little bit of shoulder rotation. Do 10 reps of this. I am going down to do 10 reps of uneven push-ups with one hand on a dumbbell. If you need to drop to your knees, that’s totally fine. Keep those elbows in nice and tight to your side. The transition is going to be 20 dumbbell swings. Keep that nice flat back. Squeeze those glutes and nice tight abs as you draw the movement. Make sure you got your weight back on your heels. Now I am going down to the overhead squat on my strong side. It doesn’t feel strong now and do 10 reps.
Then move into a thruster on my strong side for 10 reps. I do the RDL with the dumbbell on the side that you are balancing on. 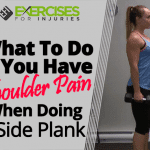 This slows it down because you need a little rest but balancing is a big issue. If you need to, just rest a bit to get your balance. I am going to a dumbbell row and I drop that leg back. 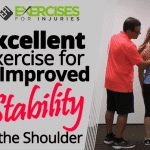 A little bit of shoulder rotation. If this weight is a little bit light for this, slow down when doing the eccentric (lowering of the weight movement). Do 10 reps of this. Dropping down to do 10 push-ups, keeping those elbows in nice and tight. Drop to your knees if you need to. Stand up and we are going to finish with the 20 dumbbell swings. Nice and tight abs. Make sure you are not rushing it. Increase the load. I am always saying increase the load but I am really concerned with you watching your form. The best news about complexes is that it can be lighter and through the course of the complex it’s going to make that weight heavy. Start off lighter and then drop the weight, you can always drop the weight on subsequent sets if you need to or you can always increase the weight. Don’t be stuck on a weight if your form is falling apart. If you are not challenged, go ahead and pick up a heavier dumbbell but by set 5 lbs. If you had enough, drop down to a lighter dumbbell. You are going to do 6 to 10 rounds of that with 3 to 5 reps per side depending on your fitness level. That is “OK to Be Single” Challenge Complex. Why Squats Are Bad and Lunges Are Good?